Wärtsilä continues to build its leadership resume in marine and energy markets, boasting net sales of $5.7 billion last year, supported by 18,000 employees with operations in more than 80 countries. Increasingly Wärtsilä is using ‘smart’ technologies in its growing scope of products for the maritime industry, from engines, onboard systems and machinery to control and navigation systems. The group is promoting its Smart Marine Ecosystem, a vision where smart vessels connect with smart ports and beyond to maximize the use of resources and operational efficiency, minimize environmental impact and risk, and achieving highest levels of safety and security. Wärtsilä aims to resolve inefficiencies in the shipping sector resulting from overcapacity, sub-optimal fuel consumption and waiting times at ports and other high-traffic areas through data integration, greater connectivity and cloud-based technology. In March this year it announced its acquisition of Transas for 210 million Euro, a global company offering marine navigation solutions that include complete bridge systems, digital products and electronic charts. 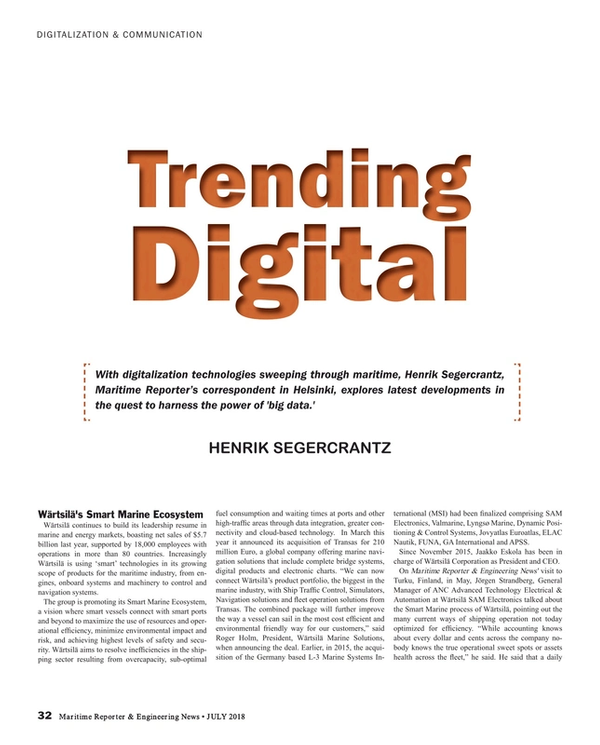 “We can now connect Wärtsilä’s product portfolio, the biggest in the marine industry, with Ship Traffic Control, Simulators, Navigation solutions and fleet operation solutions from Transas. The combined package will further improve the way a vessel can sail in the most cost efficient and environmental friendly way for our customers,” said Roger Holm, President, Wärtsilä Marine Solutions, when announcing the deal. Earlier, in 2015, the acquisition of the Germany based L-3 Marine Systems International (MSI) had been finalized comprising SAM Electronics, Valmarine, Lyngsø Marine, Dynamic Positioning & Control Systems, Jovyatlas Euroatlas, ELAC Nautik, FUNA, GA International and APSS. Since November 2015, Jaakko Eskola has been in charge of Wärtsilä Corporation as President and CEO. A study made by McKinney concludes that $20 billion Euro is wasted in global shipping yearly, in lost fuel efficiency and time at terminal. On Maritime Reporter & Engineering News' visit to Turku, Finland, in May, Jörgen Strandberg, General Manager of ANC Advanced Technology Electrical & Automation at Wärtsilä SAM Electronics talked about the Smart Marine process of Wärtsilä, pointing out the many current ways of shipping operation not today optimized for efficiency. “While accounting knows about every dollar and cents across the company nobody knows the true operational sweet spots or assets health across the fleet,” he said. He said that a daily noon report based on manual input is accepted for performance comparison, with the knowledge kept in the head of the captain or management preventing best practice to be shared across the fleet. He said that typically shipping competes only with other shipping companies; the freight to rail, road and air has an overall poor service; ship management has been commoditized; there is financial control instead of technology; and economy of scale is seen as the only viable opportunity.“Market does not reward quality due to oversupply of ships,” he said, illustrating with a study by McKinney that concludes nearly $23 billion is wasted yearly in lost fuel efficiency and time at terminal, in global shipping. Rolls-Royce has developed an Intelligence Awareness System displayed on a touch-panel, which has four user interface modes. Virtual Reality in 2D and 3D, Augmented reality and Precision mode. The Precision mode displaces accurate distances between the user and surroundings, particularly important when navigating in congested narrow waterways and when docking and undocking. The view can be rotated and expanded. The Augmented Reality mode provides live feed from intelligent awareness sensors. The object detection system identifies both static and dynamic objects. By selecting a vessel, further information is displayed. In Virtual Reality 2D and 3D modes real world data is combined with map data. Vessel speed and heading, are displayed. The information displayed can be modified to best suit the needs. Intelligent Awareness gives much better visibility. “This is the first solution on the way to autonomous ships,” says Karno Tenovuo, SVP, Shipping Intelligence, Rolls-Royce, Finland. “It is an advisory solution. We are not planning to go all the way into highest level of autonomy. We will still have people monitoring but they will be on shore=based centers mainly,” Tenovuo said. Rolls-Royce has divided its systems being developed into two parts, Intelligent Asset Management, aiming at optimizing system reliability, and Remote Autonomous Operation focusing on navigation and control and how to operate the vessels in future shipping. Rolls-Royce has during last years formed a number of partnerships with companies and organizations such as Google and the European Space Agency to develop various sectors faster and more efficiently. The vision is to see autonomous shipping first in local shipping and later globally when the regulations have been done. “We believe that a disruption is happening inside shipping right now,” Tenovuo said. In May, Rolls-Royce and Finferries, the Finnish state-owned operator of ferry services in Finland, also announced its plan to jointly develop strategies and solutions to optimize the safety and efficiency of the marine operations through developing the decision support technology and to demonstrate remote and autonomous ferry operations. A key focus will be on the research project SVAN, Safer Vessel and Autonomous Navigation, where the two partners will look to implement the findings of the earlier joint Finnish AAWA research project on developing autonomous shipping. Mats Rosin , CEO of Finnferries, told Maritime Reporter. The One Sea Partners within the Finnish DIMECC company, aiming at creating the world’s first autonomous marine ecosystem by 2025, was established two years ago by seven companies; ABB, Cargotec, Ericsson, FinFerries, Finnpilot, Meyer Turku, Rolls-Royce, Tieto and Wärtsilä. The partners are engaged in several maritime development and research programs, and in establishing the Jaakonmeri test site, the first autonomous test site for developing autonomous ships, set up outside the west coast of Finland near the city of Rauma. The site covers an area of some 9.6 nautical miles x 3.8 nautical miles and can be rented by anyone developing systems and equipment for autonomous shipping, based on an approved application with some reporting requirements, for example, regarding the equipment to be temporarily installed on the site. No underwater equipment is allowed. MacGregor PlusPartner concept is an approach to ship design that considers all parts of the cargo handling system as a whole and works forward from the cargo profile. Recent solutions developed by MacGregor include systems for smarter breakbulk stowage planning, and an autonomous discharging bulk vessel crane, the first such units to come into operation this year, with three cranes to be fitted onboard Finnish shipowner ESL Shipping’s two new liquefied natural gas- fueled ice class 1A handysize 25,600dwt bulk carriers from Sinotrans & CSC Qingshan Shipyard in China. Aker Arctic Technology owns half of the Finnish company Starkice, specialized in Arctic de-icing systems and consultancy for vessels, platforms and terminals. The Starkice heating elements are controlled using smart sensors, through a control center with graphical display. The system provides a notification about freezing conditions and activates the heating elements when needed, thus saving energy. It also determines where more power is needed and in which areas you can use less heating energy. For example, if ice starts to form on one side of the vessel only, heating is directed there. There are currently some 5,000 Starkice sensors in operation worldwide. Typical applications include decks and passages, stairs, rails, superstructure, hatches, doors, pipes and tanks and helidecks. Starkice Polarpad is a ready made heating element to be fastened on the existing deck using a special made fastening mechanism.